Lucy's voice is as clear as the dustless sky in winter. Lucy grew up in a house full of music: one of her earliest memories is standing by her Father and singing while he played the piano. Lucy would go to sleep hearing her Dad composing at the piano and wake up the next morning with the same sound. She was encouraged by her Dad to sing at local Poetry & Folk Evenings from the age of four, with him accompanying on the guitar. One of the songs they sang was Penny on the water. Lucy had learnt the song at play-school and it subsequently became the title track for her 2010 album. Lucy studied piano and oboe as a young child, and at ten begun studying harp at Bexley Music Centre. This was a fantastic evenings and weekends Music School run by the wonderful Malcolm Fletcher. He heard Lucy sing a solo in a concert at her primary school and, on the look out for children to play the harp, asked if she would like to play the instrument. 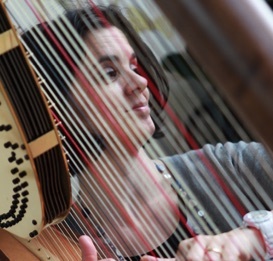 Lucy studied with Pauline Rogers, initially on one of the lever harps purchased by the school, and then on a Russian pedal harp. As well as lessons the school gave opportunities for high-level choral and orchestral music-making, both of which Lucy took part in. After school Lucy gained a Music Degree from King's College, London. As well as specialising in Music Analysis Lucy was a first study singer, studying with Corinne Sherman-Sarti. Lucy was also a member of King’s Chapel Choir, directed by David Trendell. After University Lucy trained to be a Music Therapist in Cambridge. She then taught music at Cottenham Village College and King’s College School followed by working as Director of Music at St Faith's, Cambridge. Lucy left full time teaching in 2014. Lucy has always performed regularly and has released four solo albums: May the rain fall softly (2008), Penny on the water (2010), Somewhere between the words (2016) and Songs for Christmas (2017). Where morning dawns and evening fades, an album of original worship songs, is due out Easter 2019. Lucy has been involved in church music from her early teens when she sang in the choir at All Saints Church, Footscray. She began leading worship at City Church, Cambridge in her early twenties. Since leaving teaching in 2014 she now has a varied musical life, including performing, recording, composing, teaching and worship-leading. Among other things Lucy is an associate musician of St Andrew’s in Cherry Hinton and is the Chaplaincy Harpist at Addenbrookes Hospital. She also a regular accompanist of the Lucy Cavendish Singers.